NEPAL THANKS YOU FOR YOUR HELP…BUT WE’RE NOT DONE YET! To all those that have kindly donated to Gypsy Rose’s Nepal Earthquake Relief, we are so grateful for your generosity. May God bless you & reward you for your compassion & support. Here is an update on the relief efforts that would not have been possible without your selfless gifts: You are building a house in a remote village in the foothills of the Himalaya Mountains. Through careful consideration & searching, thankfully, through an orphanage that Gypsy Rose co-founded & supports, we discovered a family with no financial ability or assistance that is in desperate need of a proper home. Their stone farming house once stood proudly in a small village on the peak of a gorgeous mountainside. Moments before the 8.1 surface wave magnitude earthquake hit at 11:56 A.M, the father was tending the fields, the mother was preparing lunch, their two daughters were playing & their 6 year old son was asleep. When the earthquake occurred everyone fled the house & by the time they realized their son was missing, the house collapsed, killing the small boy. The entire village of more than 20 houses was also completely flattened. The family & the rest of the village has been living in a shelters made of tin for more than two years. Only one other family in the village has started construction of a new home. The government of Nepal has been promising funds for victims of the earthquake & to date, no funds have been issued. Even if these funds become available, they are barely enough to build a wall. With your generous support, there are enough funds to build the entire house except the roof. That’s why we still desperately need your help. Please donate whatever you can to help. Every penny, dollar, fiver, ten spot, twenty, fifty or Benjamin will go such a long way. We guarantee that all funds donated will go 100% towards earthquake relief. (No administration fees, no kickbacks, no BS). After completion of the house, there is so much more that we plan do!!! It will take years to help Nepal recover. So please, please, please find it in your heart to help us help them. We will be forever grateful for your kindness. To make a donation: include any amount when filling out the order form. 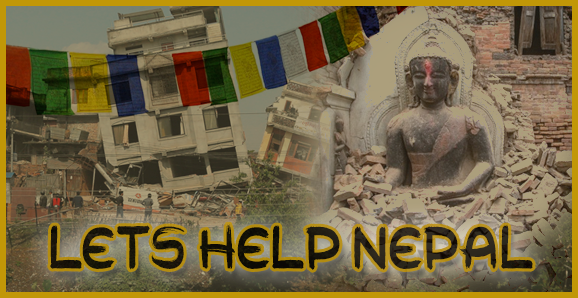 If you call in, just let the friendly Gypsy know that you wish to donate to Nepal Earthquake Relief. If you make a donation while placing your order, WE WILL send you a set of Tibetan Prayer Flags as a token of our grateful appreciation. If you make a donation without placing an order, we will send you some Gypsy Bucks to spend on your next order. We thank you for taking the time to read this and helping to assist the people of Nepal. Previous relief to Nepal has included: First response aid, food, water, clothing, medical supplies & Aid, cooking utensils, temperary shelters, building supplies, installing solar panels, and toilets.